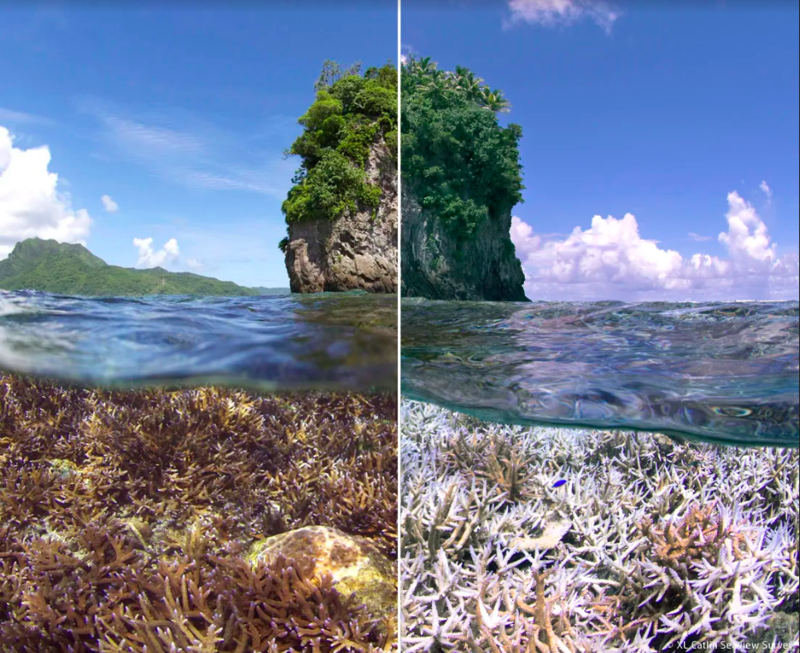 Climate change causes mass bleaching in known coral reefs. An example of bleached coral located in the American-Samoa taken with a 360 camera, XL Catlin Seaview. When a coral becomes bleached or turns a white color it’s almost like a response. When the temperature spikes a little bit above their normal range, they will start to bleach. The bright white color comes from the small plants living inside the coral’s tissues, tiny organisms providing food and a self-feeding system in the plant, and their ability to photosynthesize and feed the animal host begins to weaken causing the animal to starve. They lose the most important food source they will ever have and they leave behind a translucent skeleton. In American Samoa, islands located in the southern Pacific ocean, a well-known reef called Airport Reef has gone from a thriving environment home to many species of colorful and vibrant corals, to the remaining skeleton of deceased animals. In the last 30 years, the coral population in the reef has become completely bleached. Back in the early ’80s, biologists explored the strange reef phenomenon and over a few weeks large patches of the reefs were turning white and until recently no one really knew why it was happening. The only way, during testing and experimentation, that the coral would turn that solid white color was when the internal water temperature would be increased 3.6 degrees Fahrenheit, 2 degrees Celsius, and the only thing scientists could blame the change on was global warming calling it one of the early impacts on reefs and the ocean. Some believe fossil fuels are the leading causes of coral bleaching and the real reason many believe this is because many factories emit excessive amounts of carbon dioxide. That CO2 is being blocked by Earth’s atmosphere and radiating back into the ocean, raising the temperature. When talking about global warming, many people think that five or ten degrees increase in the air isn’t a big deal but when referencing the ocean it has a major difference. It’s like the human body temperature changing, getting higher. Imagine your body temperature, average 98.6 degrees, rising five degrees, ten degrees and more but over a period of time that change could be lethal; and that’s what is happening to the ocean. Tune in to part two to learn more about organizations dedicating their life to saving the coral reefs.